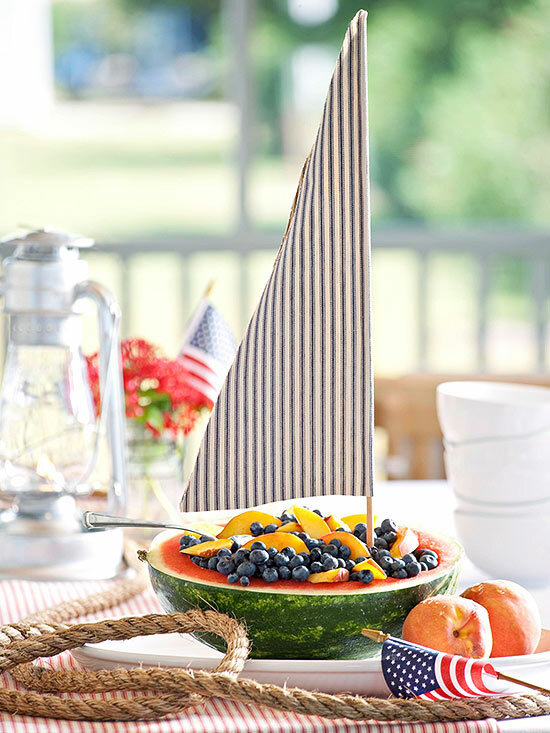 From snack ideas to table settings, these crafty serving suggestions will help you host a fabulous, patriotic picnic or potluck on the 4th of July. 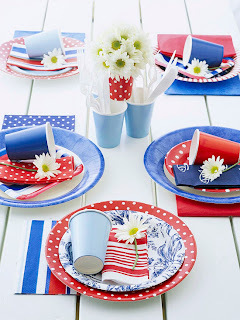 We've looked to the trends: Mason jars, paper projects, and flag motifs to help inspire a red, white, and blue holiday feast. 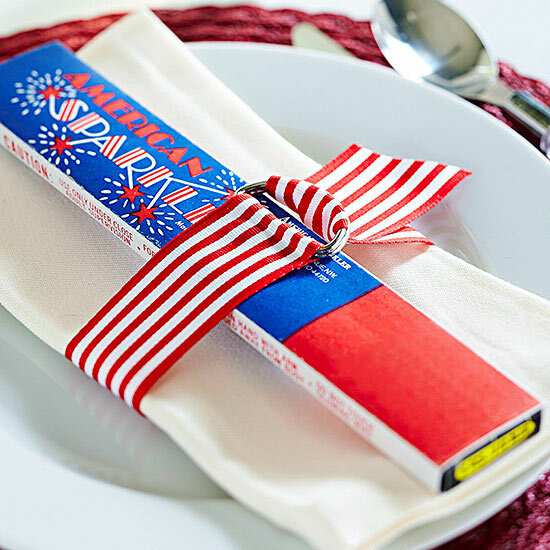 Encourage guests to get in the spirit by setting each place with a box of sparklers. For an easy, DIY napkin ring, glue the end of a 12-inch grosgrain ribbon to the flat side of a D-ring. Wrap the ribbon around a napkin and the sparklers, and loop it through the D-ring to secure. 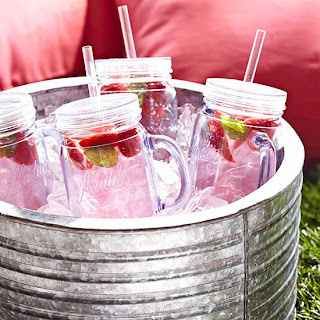 There's something classic about Mason jars, and they're great vessels for 4th of July drinks. Shop antique stores for vintage versions, or look for Mason jars with handles, lids, and straws online, which makes them perfect for portable picnicking. 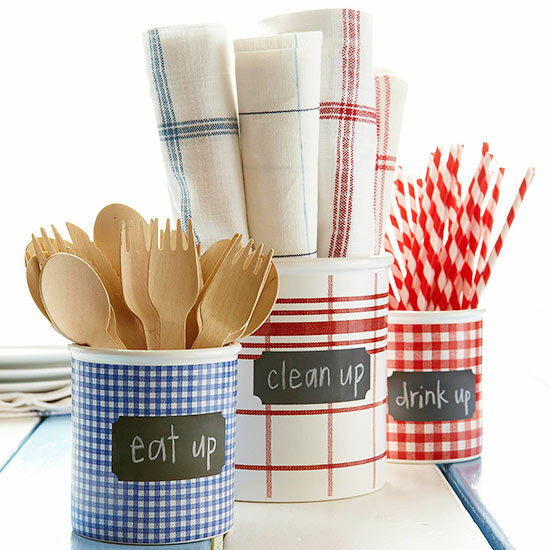 Don't bother setting the table -- guests can grab what they need from these adorable, no-fuss utensil jars. 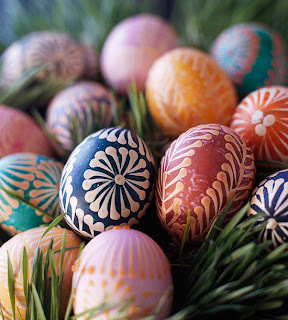 Simply decorate containters, like empty oatmeal canisters, by wrapping them with festive paper and securing with tape. Add an adhesive chalkboard label to send a fun message. 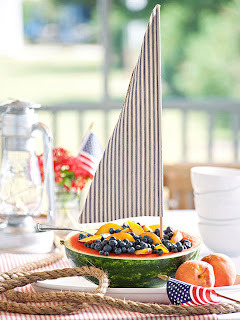 A simple sail is all you need to transform a watermelon fruit salad into a seaworthy centerpiece. Cut a triangle from ticking fabric and fold it in half over a dowel. Hot-glue the fabric along the dowel to secure and along the loose edges for a stiff sail. 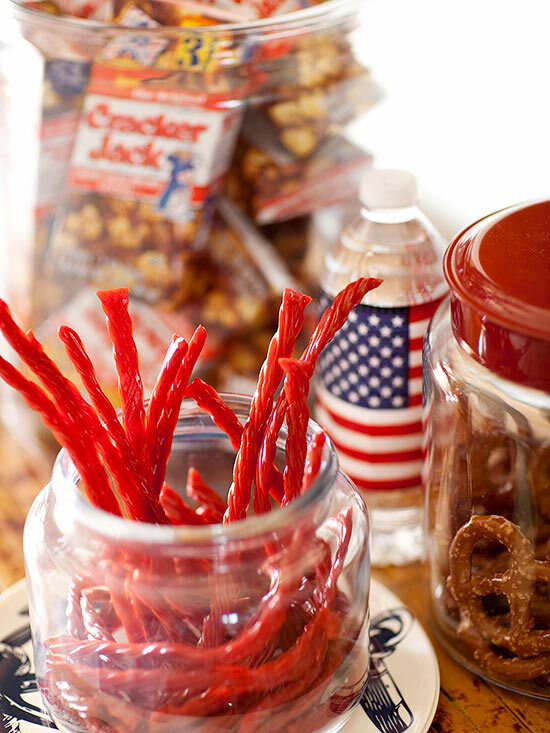 An arrangement of classic snacks is a great way to keep guests happy until the 4th of July picnic begins. We love the bright colors and nostalgic feel of licorice, pretzels, and boxed caramel popcorn. Salute Old Glory with star-studded napkin rings. Stamp "USA" into metal tags using a steel stamp set. 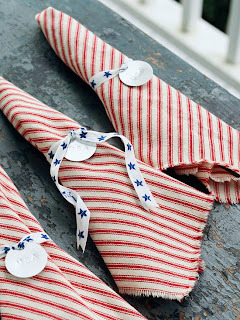 Thread star-pattern ribbon through the tags and wrap around striped napkins. 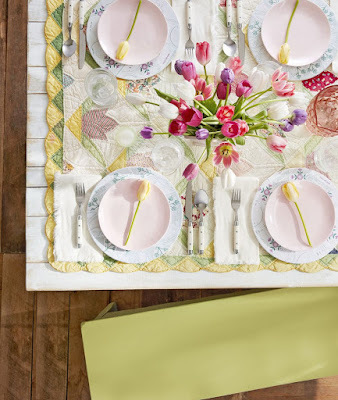 For no-sew napkins, cut cotton ticking in 16-inch squares; fray the edges by pulling on the threads. You also can roll silverware into the napkins for guests to grab as they head through the buffet line. 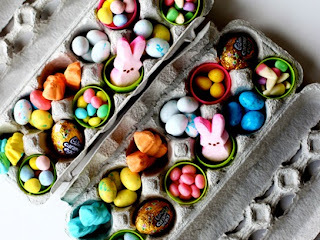 Use food to decorate the picnic table. Form sturdy waxed paper into cones, securing with transparent tape. 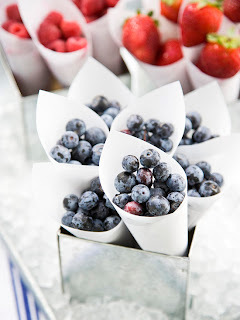 Fill each cone with blue or red berries to create a sweet treat and dazzling display all in one. 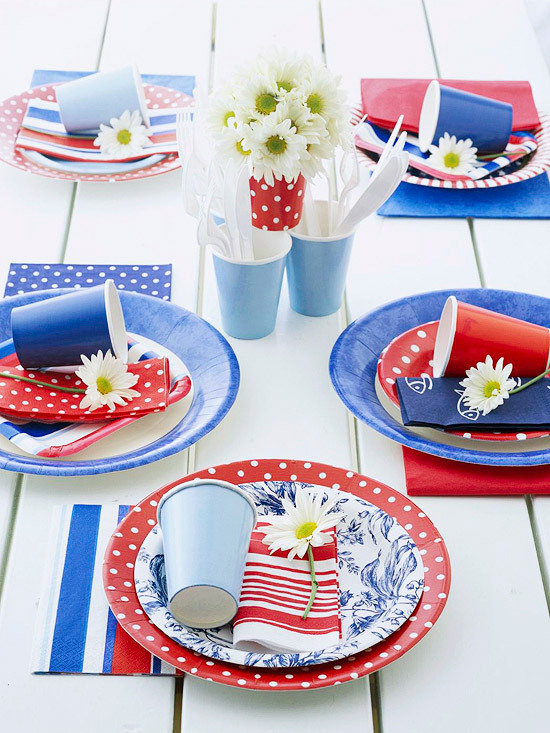 Mix and match assorted paper goods to create a patriotic table setting. Don't worry if the blues and reds don't match perfectly -- together they'll create a cohesive look suitable for any patriotic holiday. For a fun presentation, preassemble hot dogs or burgers with buns wrapped in waxed paper. 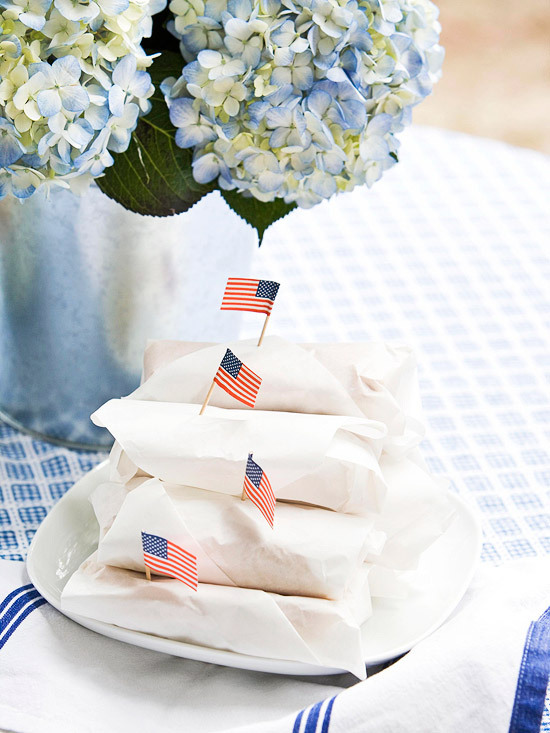 Secure the wrap with an American flag toothpick. 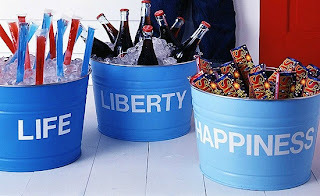 Display famous words from the Declaration of Independence on galvanized tubs. 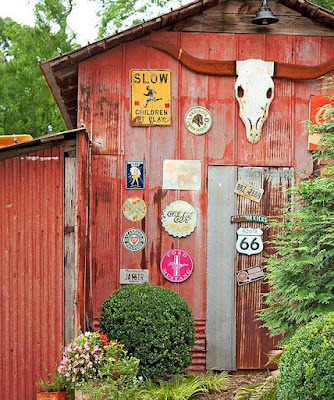 Coat tubs with white metal primer. Then paint each tub a different shade of blue. 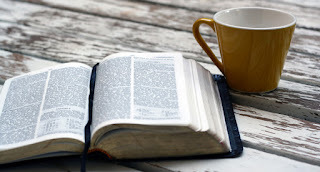 (Buy deep blue exterior paint and dilute with white exterior paint to get the two lighter hues). 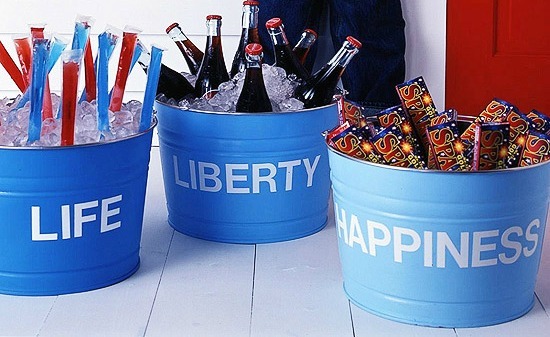 Use letter stickers to spell "life," "liberty," and "happiness" on the tubs. Fill with ice to hold drinks or frozen treats, or use without ice to hold sparklers for some 4th of July fun.